Here's something I've been looking for for awhile now for a project I've got in the works, and figured some of you guys may be looking for the same thing. They're based off of the schematic published by the one and only R.G. Keen, found here. 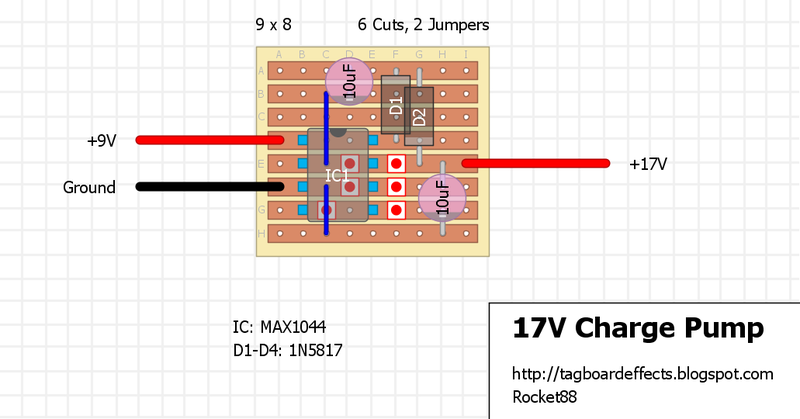 Note: You can NOT substitute the MAX1044 for 7660s or NE555 IC. 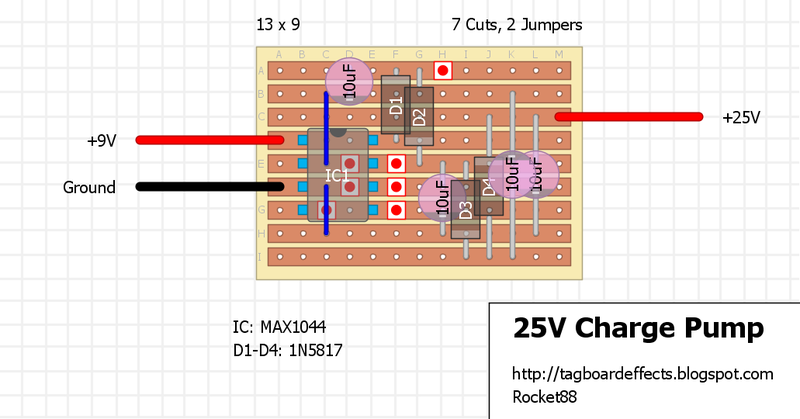 It looks like the "17V Charge Pump" layout is actually the 25V circuit. for me they show up in the right position. if you're referring to it based on the schematic, they should be right. 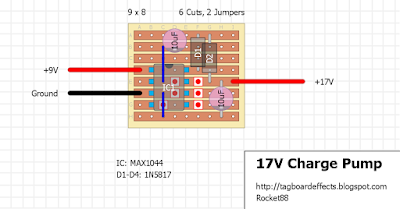 Here's the problem I see on the 17V layout. One of the 10uF caps should connect between the junction of D1 and D2 to pin 2 of the IC. The cathode of D2 will then be 17V. Likewise there should be a 10uF cap between the junction of D3 and D4 and pin 2. The cathode of D4 will then be 25V. The 33V layout has the same connection issues, I don't see any caps connected to the junctions of the diode pairs. But it should correctly output 33V. nice spot, you're right. also, the 17V pump is actually 25V. made the corrections. I´ve been looking for charge pumps that could supply more that 18v from a 9v source with no success, so thanks so much! Could I just throw the 33v charge pump inside a fet build, (let´ say sunn mode T preamp), without damaging the transistors? And what about the caps on the 33v charge pump layout? Do they need to be above 33v as well? A careful reading above answered my question, thanks. What kind of current does the 33V deliver? Did you hear a noticeable change in sound/behaviour? Not sure if he did, but theoretically you will hear a difference. FETs like higher voltage. any idea how much current you can get with those ? 20mA at which the output voltage? nope. you need a max1044. i should add that to the info actually. Could you use this to power a Tiny Giant? Nope. The max1044 provide 20mA and the tiny giant needs up to 120mA. For the 33v layout, the number of cuts is off by one, and so is the number of rows. I cut my vero 1 row too small, but found that if you add a cut a column L row 1 and move the three components that join on the bottom row to the top row you can save yourself a bit of space. I'm planning to use this to drive the H&K redbox instead of using phantom power. Wish me luck! Be careful when cutting the vero. All layouts have one row missed at the size info notes. Thought I fixed that. I guess I forgot to reupload it. I'll take care of that tonight. I put this infront of a tube screamer (son of screamer) and theres very little difference? I was expecting more headroom and tighter tone? Any knowledge anyone could share concerning this? Just personal experiences. Opamp based circuits rarely sound any different when fed anything from 5V to 18V. The headroom you were expecting could be achieved by using a swing of +9V/-9V or +12V/-12V, like seen in Maxon OD820 and the like. So to my knowlwdge, there is little to no point in using a pump with standard tubescreamer circuit. I've tried it myself back in the day too. If you have a lab supply, you could try the circuit without a pump and change the supply voltage gradually from 5V to 18V. I can tell you the difference in tone is not that audible at all. Well. 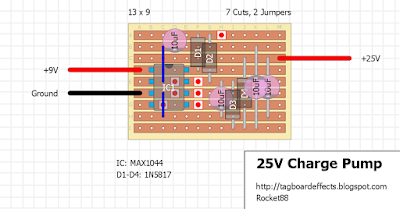 Perhaps some other type of opamp could behave differently with higher Vcc, but i doubt it. which one can be used with a tonebender mkii npn? Aren't 1n5817 diodes only rated as 20 volts? So, shouldn't the 25volt and 33volt charge pumps use something rated for 25, 33, or higher? So, something like the 1N5818 Diode Schottky 30 Volt, or 1N5822 Diode Schottky 40 Volt? Ohh, or the 1n4001 which is 50 volts?